When it comes to safety and your child, you can never have enough. That is why it is important to protect your child from harmful chemicals and items that may harm them in kitchens, bathrooms, bedrooms, garages, and other areas of the house or office that your child may have access to. You may also want to limit access your child to cabinets and drawers if you want to keep them neat and tidy or if you want to ensure that they can’t get into them and hide. All of these are good reasons to secure cabinets and drawers. The best way to do that is by using cabinet locks. Cabinet locks come in many different forms. We will be looking at several different kinds. Here are a few of the most popular on the market today. There are many different types of locks for cabinets to help keep your children safe. Let’s go over what they are, how they function, and how they look aesthetically. If you don’t want to notice any hardware on your cabinets, then the magnetic cabinet lock is properly what you are looking for. They are installed on the inside of your cabinet door or drawer and can most of the time be installed on the top, bottom, or side of the door – so you have lots of installation choices. Some magnetic cabinet locks do require hardware installation while others are installed by use of adhesive tape. Be aware that the ones that use adhesive tape do not stand up to the use that the hardware installed ones do. However, if you are in a rental property, you may need permission to install the hardware installed based locks. Once the lock is installed on the door or drawer, there is no gap – so there is no chance of little fingers and hands getting pinched. It can only be opened by the magnetic key. Make sure that you don’t lose the key or you will be in trouble. Another thing to be aware of is that the magnet may have a difficult time working on doors and drawers that are extra thick. Always read the manufacturer’s booklet to ensure that your doors are within their standards. Another great feature about most of the magnetic cabinet doors is that you can turn the locks off when the child is not around or if you will be in the cabinet a lot with a simple turn of a switch or knob. Just make sure that you reengage the lock. If you live in a rental unit and can’t drill or leave any hardware behind, you may want to consider using adhesive mounted cabinet locks. These cabinet locks are great because when you are done with them, you can remove them when you are done with them. Most adhesive mounted cabinet locks have a strap in the middle that may or may not be adjustable that has an anchor point on either end that you stick on the surface of the item that you want to lock. Because most adhesive mounted cabinet locks have a flexible strap in the middle that means that the lock can be bent around corners. That opens up locking opportunities that other locks do not. With these locks, not only can you lock cabinets and drawers, but you can lock appliances such as microwaves. These multiple purpose locks can be used in every room of the house. The only thing that you have to be worried about is making sure that you purchase locks with reliable adhesive. Another concern is that some adhesive may pull the surface paint or stain off of the surface of the cabinet when you pull it off. To test this out, you may want to test one on an interior cabinet door before putting it on the exterior. You can always replace the adhesive. For added security, look for locks that have dual release buttons to ensure that a child has a hard time opening the lock. If you have side by side knobs on your cabinets, then you are a candidate for having cord cabinet locks. While this market is very limited because this type of lock only works on cabinets with one type of knob, the lock does have several perks. The cord cabinet lock is one of the easiest on the market to install and take off as needed. You can even use this lock with one hand. You only have to pull the cord around your two cabinet knobs and use the button on the lock to tighten or to release the cords. While you will have no problem at all using these cabinet locks, your child will be unable to figure it out. On the negative, the cords will attract the attention of your child and they may like playing with them even if they can’t figure them out. However, they are great for renters because they require no tools or hardware, leave no marks, and cause no damage to the cabinets. While a sliding cabinet lock can work on both cabinet knobs and handles, they work best on mushroom-shaped or D-shaped handles. Sliding cabinet locks are long U-shaped latch that fits between two handles and locks. These locks are great because you can generally work them with one hand, they are inexpensive, and they require no hardware or tools. Since there is no hardware required, you leave no lasting impression when you are done with the locks. Children have a hard time with these locks. However, these locks are not made for longevity and may break over time if they are used on a consistent basis. Since they are inexpensive, just buy extras if you like the style. Beware if you try using them with a standard knob, they may just slide off, making it easy for your child to open the cabinet. A spring release latch is a more old school type of cabinet lock. With this type of cabinet lock, you install a latch and catch inside the cabinet or drawer. While you can’t see any hardware from the outside, that is where the benefits end. First of all, if you are a renter, you may need permission from your landlord to permanently drill into a cabinet. Second of all, once you remove them, you have holes on the inside of your cabinet. Next, when you open your cabinet or drawer, you have a small gap before it catches. First, this could pose as a pinching threat to your child. You then have to press down on the latch to release it. While it sounds okay in theory, a child will figure this out quickly. It may work for babies and small toddlers, but you will have to improve your safety fixtures before they get too old. Second of all, there is no way to bypass this, so if you use this cabinet or drawer a lot, this may become bothersome to you. We need to look for many features when we are considering the purchase of cabinet locks. Here are a few features that you should take into consideration before you make a purchase. Hidden Hardware – You don’t want to see any hardware when you enter the room. This gives you a clean look and all you notice is the cabinetry. Adhesive that can stand up to time – Some adhesive does not stick like it should and the lock or latch falls with continued use. Some adhesive can be replaced but if you are constantly having to replace it, it is not worth it. You want a strong adhesive that does not have to be constantly fixed. Strong Magnets – Look for a strong magnet that will pick up the latch even through thicker wood front cabinetry. Locks that serve multiple purposes – Some locks can be used on cabinets, drawers, and even small appliances. If you are looking for multiple purpose locks, then you may want to look for Adhesive Mounted Cabinet Locks. No tools or hardware needed – If you are a renter or don’t want to put screws in your cabinetry, then look for cabinet locks that don’t require hardware. Beware that hardware locks normally stand the time longer. Price Range – Cabinet locks range in price depending on the features, how many locks in a package, and how aesthetically pleasing they are. Doesn’t damage cabinetry – If you are looking for a lock that won’t damage a cabinet, look for no hardware. In addition, be aware that some adhesive can also damage cabinetry so you may want to do a test on the back side of the cabinet before adhering the lock to the front. Your best bet would be a cord or sliding cabinet lock if you are a renter and did not want to affix to the cabinets at all. Versatility – Some cabinet locks are more versatile than others. Just look at their features and see what fits best for you. Also consider that cabinet locks are not only for kitchen and bathrooms but other rooms in the house such as bedrooms, offices, pantries, and other areas. Look for features that would serve these areas as well. Just because you use a cabinet lock that does not mean that your child is out of the woods. While that does improve the odds of keeping your child away from harmful items, you still have to do your job as a parent to ensure that your child stays safe. Here are a few more tips on how to improve on your child’s safety. Try not to let your little one see how you unlock the cabinet. Children like to imitate adults and learn this way. If your child sees you unlock the cabinet enough, he will learn how to do so on his own if he is strong enough. Simply place your body between your child and the cabinet when opening it if they are in the room with you. If this step seems a little paranoid, then good – their safety is at stake. The longer it takes your child to figure out how to open the cabinet, the longer they are safe. No cabinet lock is 100 percent safe. It may slip your mind or the mind of someone else to lock the cabinet back and suddenly your child is exposed to things that you tried so hard to protect them from. To help prevent this, move chemicals, china, and other items of concern to an area that would be more difficult for your child to reach. You can also put cleaning products in containers with childproof tops. Children are very good at coming up with ways at putting themselves in danger or hurting themselves. That is why there is no substitute for adult supervision – no even cabinet locks. Cabinet locks do not and will not stop your child from getting into things. There is no substitute for adult supervision. The kitchen and bathroom are the most dangerous rooms of your home. While your child is in these rooms, keep them safe by keeping a close eye on them. Toxic household chemicals such as cleaning supplies, pesticides, detergents, and other agents need to be locked in a cabinet that is high away from children. If you are able to, you may want to consider changing from ammonia and chlorine bleach to products that are safer such as beeswax, mineral oil, borax, vinegar, and other safer products. Try to only purchase products such as medication and chemicals that have child-resistant caps. Remember that you need to always keep these items in their original containers and never change them into food or generic containers as this can lead to mix-ups. Child resistant does not mean child proof. Store all medication and chemicals in locked cabinets that are high and not in sight. Even simple items such as cling wrap, aluminum foil, and plastic bags should be stored in locked cabinets. Not only do cling wrap and aluminum foil have sharp edges that could pose a danger but cling wrap, plastic bags, and other similar items are a suffocation danger. Knives, blades, and other tools that are sharp should be stored in locked drawers. In addition, graters, peelers, and other sharp tools should also be treated as knives. Large butcher blocks should be stored in locked cabinets. Make sure that the bathroom is safe too by putting a lock on the cabinet where you have your scissors, nail clippers, razors, tweezers, and any other sharp items. All china and glassware should be in locked cabinets or in high cabinets. All small appliances, such as toasters, should be kept out of reach of your child and placed in a cabinet where they cannot reach them or the cord. In the bathroom, lock small appliances such as hair dryer up so your child can not get to it – or the cord as they could pose a shock or fire hazard if placed in water. Other items such as curling irons could lead to burns. Place a latch on the refrigerator, oven, and microwave. On your stove, you also need to put knob covers on the temperature knobs. This way your child won’t be able to turn on the stove. When not in use, keep your dishwasher closed. Do not keep any dishwasher detergent in the machine until you are ready to turn it on because it can be toxic if eaten. Keep the latch on the dishwasher. Put a lid with a latch on your trash can. If you recycle, keep it out of reach of your child. Put a latch on your toilet seat. Children love water but water can be dangerous – even a small amount. Don’t forget that you have a child and they want to have fun. That being said – set up one cabinet in your kitchen just for your child that they can open and have things in. Make sure that it is not close to any appliances. Fill the cabinet with interesting but safe things such as wooden spoons, empty containers, storage containers, and more. Every now and then, change it up. This should keep your child occupied and hopefully, he won’t care what is in the other cabinets as long as you keep them closed – and locked. 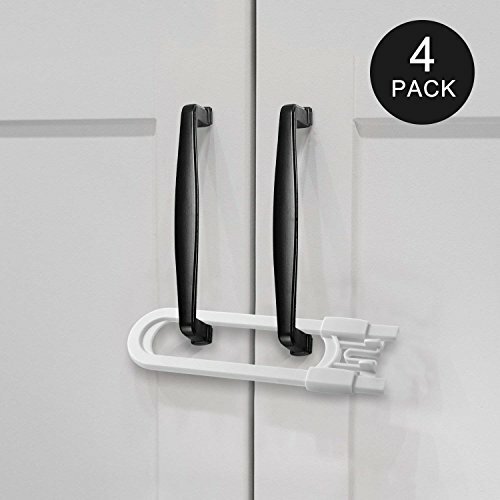 If you are looking for a cabinet lock that is multi-purpose, then you may want to consider the Munchkin Xtraguard Dual Action Multi-Use Latch. These latches can secure appliances such as microwaves, toilet seats, drawers as well as cabinet doors. These latches require that you use dual buttons to release the latch which would be difficult for a child. 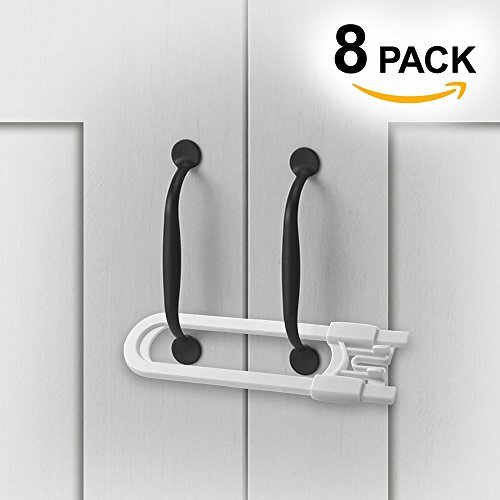 With the flexible straps, you can use these straps around corners. The installation is super easy with the adhesive that comes with the kit. The adhesive won’t damage your cabinets as it comes off cleanly once you are done using the locks. You can get these locks in a two pack or an eight pack. 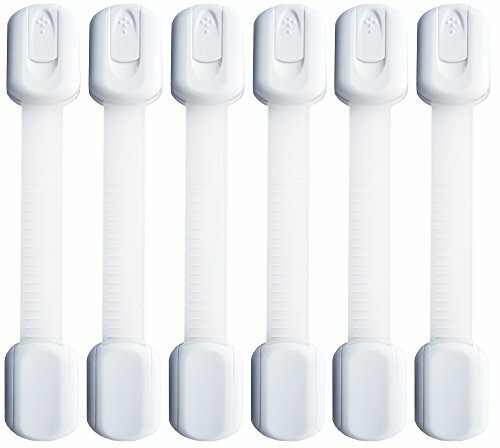 These locks come in an attractive white color. The packs of these cabinet locks are affordable. Since the locks have a flexible latch, you can use around corners or straight. So, you can use them for multiple purposes. 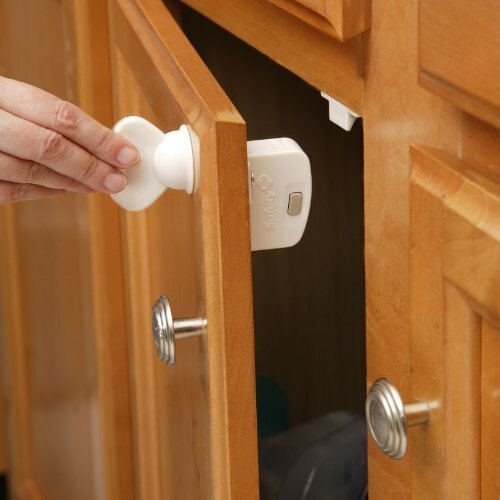 These cabinet locks are easy to install and remove. Because the cabinet locks are mounted with adhesive, they can be pulled off accidentally and be deemed useless. If you leave the adhesive on a while and try to remove, it may damage your cabinetry. The cabinet locks are visible to everyone. If you don’t mind having a visible cabinet lock, then the Munchkin Xtraguard Dual Action Multi-Use Latch seems to do its job. It is hard for children to get in them and it is great that they are multiple purposes. I would suggest that you first try to install on the inside of a cabinet to see if the adhesive does any damage to your cabinet first before installing to the outside where it is visible. If it causes damage, then do not use on your cabinet. Adhesive reacts differently to different types of materials and that might be why some materials have shown damage while others have not. Just use caution and test in a non-visible area first. 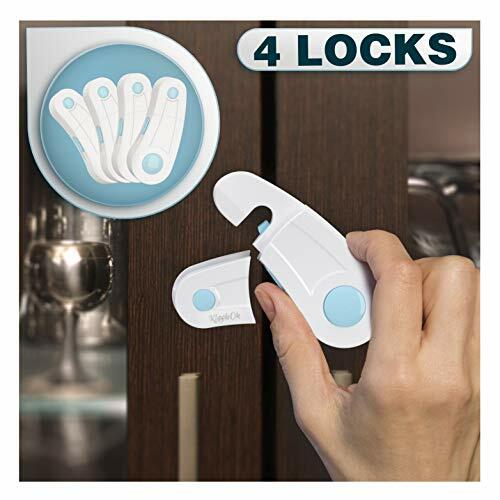 If you want to keep your kitchen looking neat and uncluttered without the look of external hardware while still keeping your child safe, then you may want to take a look at Jambini Magnetic Cabinet Locks. These magnetic locks are installed inside your cabinets for a clean look and you cannot see any hardware from the outside of the cabinets. You don’t need to use any tools to install these locks, simply use the included 3M adhesive tape for each lock and in under three minutes, your cabinet lock is installed. Nobody will even know that you have cabinet locks – until they try to open a cabinet. These locks are designed to fit any size cabinet. With the locks and latches on the inside of the cabinet, children cannot squeeze their fingers in between and get hurt. If children are not around, you can disengage the lock by flipping a switch. To open the door, strong magnets are used as keys. This kit comes with four locks and 1 key. You cannot see any hardware from the outside. You can disengage the cabinet lock when children are not around. You do not need any tools for installation of these cabinet locks. You will not damage your cabinetry with these cabinet locks. If your cabinet doors are too thick, the magnet may not work. After time, you may have to change the adhesive out of constantly using the doors because they may wear out. Overall, magnetic cabinet locks offer a lot. The Jambini Magnetic Cabinet Locks give you that clean look you want in a kitchen without all the additional hardware that you have from some other cabinet locks. In addition, it is nice that you can disengage the locks when you don’t need them and that the adhesive won’t hurt your cabinetry. It is concerning that the magnets won’t work on thick upgraded cabinet doors and that you may have to change out the adhesive after some time. However, just like anything, some maintenance is expected to keep things in good running order when you use them a lot. If you are looking for a cabinet lock that is multiple purposes, then you may want to consider the Secure Home by Jessa Leona Baby Safety Locks. These locks can secure appliances such as microwaves, toilet seats, drawers as well as cabinet doors. You can customize the size of the flexible latch with the sliding locks. The latching system allows the adult to operate the system with one hand and only one finger. With the use of 3M adhesive, the safety locks install in minutes with the use of no tools. To remove without damage, simply use the heat of a blow dryer to heat up the adhesive and slowly peel away. This product has a 100 percent money back guarantee within the first 90 days. 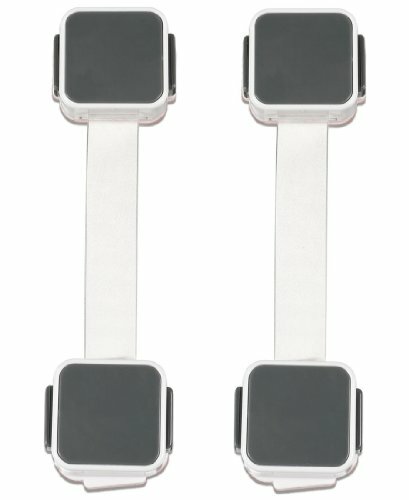 This safety lock comes in white or black and in packs of two or six. You can customize the length of the flexible latch with these cabinet locks. The latch can go around corners so it is multiple purposes. The cabinet lock installs in minutes with no tools and is easy to remove. This product has a 100 percent money back guarantee. If your child is older, they can probably open this on-touch cabinet lock. Upon removal of the lock, cabinetry stain may also be removed. The cabinet latch can break in half if used too often; not made to be constantly opened and closed. My findings on the Secure Home by Jessa Leona Baby Safety Lock were a little mixed. While they are easy to install, are multiple purposes, can be adjusted, and have a money back guarantee, there are many concerns. Some have had children open cabinets which is very dangerous depending on what is in the cabinets. In addition, the latches have broken and cabinets have received damage upon removal. With the mixed reports, this is one cabinet lock that I would probably skip. If you are looking for a traditional sliding lock, then you may want to consider the Adoric Sliding Cabinet Lock. This lock has a long U-shaped latch that will fit up to five inches to fit a wide variety of cabinet door handles. This lock has a one-year replacement and refund warranty. There are no tools or adhesive needed to install or remove this cabinet lock. This lock leaves no marks on the cabinet. To unlock, you must press two buttons at the same time – which is hard for children but most adults can do. 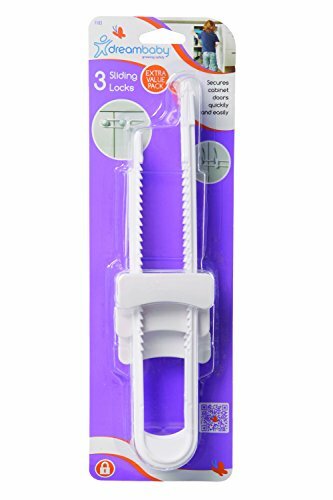 These sliding locks are great for side by side knobs and handle on cabinets, refrigerators, cupboards, and more. This kit includes four white sliding cabinet locks for use on multiple doors. These cabinet locks are inexpensive. 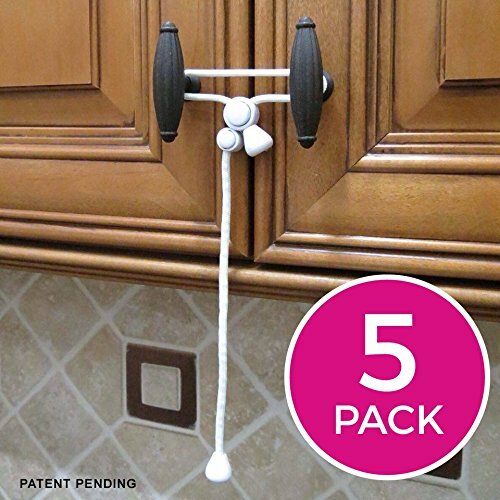 These cabinet locks are reusable and can be moved from one set of cabinets to another. No tools or adhesive is needed and they leave no marks. These cabinet locks are hard for a child to get in to. The Adoric Sliding Cabinet Lock is an external lock so they can be seen by guests so they do add to the sightline. The cabinet lock will slip off of round handles as they are not made specifically for them. If the part you squeeze to release breaks, it is hard to get the lock off. While the sliding lock is a little old-fashioned, it still does a great job. The Adoric Sliding Cabinet Lock is great because it is inexpensive. You can also move this lock from cabinet to cabinet. The installation of this cabinet lock doesn’t require tools. This cabinet lock has a one year warranty. And it is hard for a child to get in to. The Adoric is not without its faults. You can see the locks when you enter the room. The cabinet locks are not made for all types of knobs and handles. If the cabinet lock breaks, they are hard to remove. All that being said, these locks are still a pretty safe bet. If you are looking for a streamlined and clean look, then consider the Eco Baby Child Proof Cabinet and Drawer Magnetic Safety Locks. These safety locks are on the inside of the cabinet and drawers so they are not visible from the outside. These locks are improved and have magnetic locks that will work on doors that are up to 1.75 inches thick. You can install the lock on the top, bottom, or side as long as it is flat. For a strong installation without tools, this kit includes 3M Adhesive Tape. That means there is no drilling and it is safe for your cabinetry. It also means that installation and removal only take minutes. This product has a 100 percent 18-month warranty. Once installed, these cabinets are easy to open with the one-click magnet knob. When you don’t have a little one around, you can disengage the lock mode by disabling the locking function with the flip of a small lever. You can get the kit with five lock and plates and one key or 12 locks and plates and two keys. They all come in white. The magnet is improved and can work on cabinet doors up to 1.75 inches thick. This cabinet lock uses 3M Tape, so no drilling or tools needed. This cabinet lock has a 100 percent 18-month warranty. You can disengage the cabinet lock mode when the little ones are not around. You cannot see the cabinet locks from the outside of the cabinets. After time, you may have to change the adhesive out of constantly used doors because they may wear out. The magnet that is inside the key easily falls out and becomes a choking hazard if you don’t notice that it has come out. 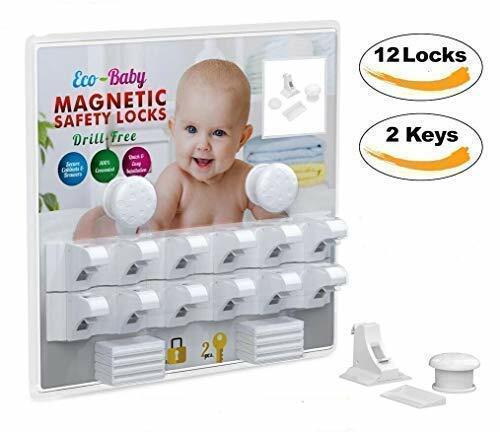 The Eco Baby Child Proof Cabinet and Drawer Magnetic Safety Locks seem to be comparable to the other magnetic cabinet locks that we have looked at. You can install and remove them easily. In addition, you can disengage the locks when your child is not around. And best of all, you cannot see the locks from the outside of the cabinets. However, it seems to have the same problems. The magnet does not want to work through thick cabinet doors even though it says it does. Not only that, but the magnet can fall out of the key making it a choking hazard if you are unaware that it has fallen out. In addition, the adhesive does not stand up to time. You just need to weigh the pros and cons and decide if you want to put the maintenance into these locks that are needed. If you are still looking for that streamlined and clean look, then take a look at the Adoric Magnetic Baby Safety Latch Locks. These safety locks are on the inside of the cabinet and drawers so they are not visible from the outside. This product has a 100 percent 12-month warranty. Once installed, these cabinets are easy to open with the one-click magnet knob. When you don’t have a little one around, you can disengage the lock mode by disabling the locking function with the flip of a toggle switch. You can get the kit with six locks and plates and two keys or 12 locks and plates and two keys. They all come in white. The cabinet lock uses 3M Tape, so no drilling or tools needed. Adoric Magnetic Baby Safety Latch Locks have a 100 percent 12-month warranty. The adhesive is not sticking as it should. The knobs break open and the magnet comes out causing a choking hazard. The Adoric Magnetic Baby Safety Latch Lock seems to be comparable to the other magnetic cabinet locks that we have looked at. You can install and remove them easily. In addition, you can disengage the locks when your child is not around. And best of all, you cannot see the locks from the outside of the cabinets. Are you looking for cabinet locks for side by side knobs? Then take a look at the Kiscords Baby Safety Cabinet Locks for Knobs. These locks only work on cabinets where the knobs are side by side. 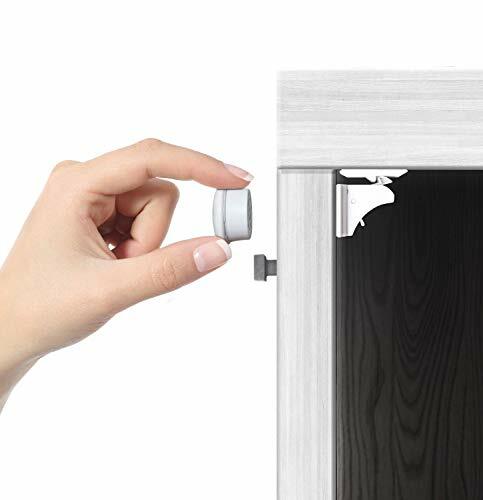 There is no drilling, magnets, or adhesive needed with this cabinet lock. You can lock cabinet that has knobs up to six and a half inches apart from the center. These lock with simple cords that are easy for adults to unlock but difficult for children to figure out. They are simple in design but they get the job done. These locks come in black or white to best fit in with your home’s décor. Both colors come in a five pack. These locks come with a 30 day 100 percent money back warranty. These locks are easy to install and take off and will not damage your cabinetry. These cabinet locks are easy to install and take off. These cabinet locks are affordable. There is no drilling, magnets, or adhesive required with these cabinet locks. Kiscords Baby Safety Cabinet Locks for Knobs come with a 30 day 100 percent money back warranty. These cabinet locks are visible from the outside of the cabinet. The hanging cord makes a child want to play with it. This cabinet lock only works on cabinets that have knobs that are side by side. The Kiscords Baby Safety Cabinet Locks for Knobs is actually a pretty good concept. It takes away the drilling, magnets, and adhesive that we fuss about from the other cabinet locks. In addition, the locks are easy to take on and off. It is great that these locks are affordable. Best of all, these locks come with a money back warranty. However, if you are looking at the line of vision, these do not add to the sightline in a room. Also, the cord makes a child want to play with it. Unfortunately, the lock only works on cabinets that have knobs that are side by side up to a certain distance apart from each other. If you meet all these criteria and don’t mind the look, then you may have found your cabinet lock. If you are looking for a traditional sliding lock, then you may want to consider the Dreambaby Sliding Locks. This lock has a long U-shaped latch that will fit mushroom and D shaped knobs and handles. These kits come in three, six, or nine white sliding cabinet locks for use on multiple doors. These are also available in silver. No tools or adhesive are needed and they leave no marks. Dreambaby Sliding Locks are an external lock so they can be seen by guests so they do add to the sightline. The cabinet lock breaks easily with pressure. While the sliding lock is a little old-fashioned, it still does a great job. The Dreambaby Sliding Lock is great because it is inexpensive. This lock is great because it can be moved from cabinet to cabinet. The installation of this lock doesn’t require any tools. This lock is available in different colors. Best of all, it is hard for a child to get in to. The Dreambaby is not without its faults. You can see the locks when you enter the room. The locks are not made for all types of knobs and handles. Unfortunately, they break easily with pressure. All that being said, these locks are still a pretty safe bet. If you are looking for a traditional sliding lock, then you may want to consider the Regional’s Homes Sliding Cabinet Locks. This lock has a long U-shaped latch that will fit up to five inches to fit a wide variety of cabinet door handles. This lock has a 30 money back guarantee. This kit includes eight white sliding cabinet locks for use on multiple doors. The cabinet locks are hard for a child to get in to. Regional’s Homes Sliding Cabinet Locks are an external lock so they can be seen by guests so they do add to the sightline. If the part you squeeze to release breaks, the cabinet lock is hard to get the lock off. While the sliding lock is a little old-fashioned, it still does a great job. The Regional’s Homes Sliding Cabinet Lock is great because it is inexpensive. In addition, you can move these locks from cabinet to cabinet. These cabinet locks have a great 30-day money back guarantee. Best of all, these locks are difficult for children to get in to. The Regional is not without its faults. You can see the locks when you enter the room. Unfortunately, they are not made for all types of knobs and handles. In addition, if they break they are hard to remove. All that being said, these locks are still a pretty safe bet. If you are still looking for that streamlined and clean look, then take a look at the Safety 1st Magnetic Locking System. These safety locks are on the inside of the cabinet and drawers so they are not visible from the outside. For a strong installation, these locks use screws. That means that there is no adhesive that will wear out in just days and no tape to pull the finish off your cabinets. This product is by a trusted baby product name – Safety 1st. You can get the kit with two locks and one key, four locks, and one key, or eight locks and one key. They all come in white. Installation is simple and there is no tape to wear off or pull off. You must drill into the back of your cabinets. Your cabinet door can’t be too thick or the magnet won’t work. The Safety 1st Magnetic Locking System seems to be a step ahead of the other magnetic cabinet locks that we have looked at. These cabinet locks have some great features. First of all, you can install and remove them easily. Not only can you disengage the locks when your child is not around but there is an indicator to let you know when the lock is engaged. And last but not least, these locks cannot be seen from the outside of your cabinets so your sightline is not disturbed. While this cabinet lock seems to be great, there are a couple of flaws. The magnet does not want to work through thick cabinet doors and you must drill into the back of your cabinets. If you are still looking for that clean look, then take a look at the KiddyByte Magnetic Child Safety Cabinet Locks. These safety locks are on the inside of the cabinet and drawers so they are not visible from the outside. Once installed, these cabinets are easy to open with the one-click magnet knob. When you don’t have a little one around, you can disengage the lock mode by disabling the locking function with the flip of a switch. You can get the kit with twelve locks and three keys or twenty locks and three keys. They all come in white. The adhesive is not sticking as well as it should. 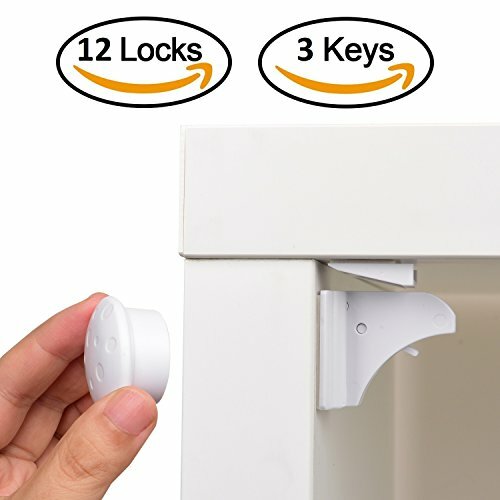 The KiddyByte Magnetic Child Safety Cabinet Locks seems to be comparable to the other magnetic cabinet locks that we have looked at. You can install and remove them easily, you can disengage the locks when your child is not around, and you cannot see the locks from the outside of the cabinets. However, it seems to have the same problems. 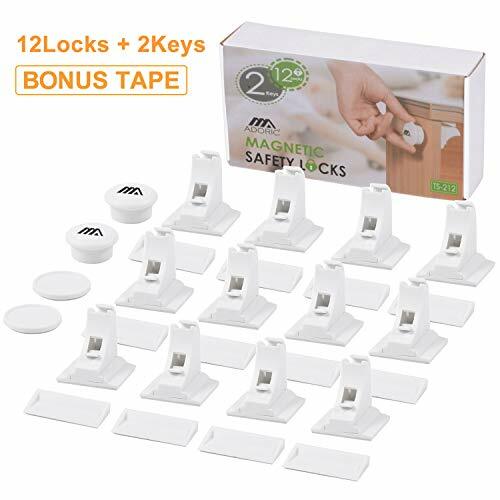 The magnet does not want to work through thick cabinet doors even though it says it does, the magnet can fall out of the key making it a choking hazard if you are unaware, and the adhesive does not stand up to time. If you are looking for a different type of cabinet lock than you have seen before, then you may have been waiting for the KloobOk Cabinet Locks. These locks will provide the maximum amount of safety for your child – and that is guaranteed. This lock is constructed on non-toxic eco materials that are durable and childproof that are constructed for long-term use. The KloobOk Locks don’t require any drilling and they are easy to install with 3M Tape technology. This means you can also remove them and stick them somewhere else with new tape. This lock comes with a 100 percent money back warranty. These white locks come in a pack of four. These cabinet locks require no drilling, are easy to install and remove. These cabinet locks have a money back guarantee. KloobOk Cabinet Locks are constructed of non-toxic eco materials. These cabinet locks are an external lock so they can be seen by guests so they do add to the sightline. The cabinet must be flat – not raised – in order for these cabinet locks to work. The adhesive does not stick very well. The concept behind the KloobOk Cabinet Locks is a great one. To have a lock that is made from non-toxic eco materials for a child is a great concept. In addition, there is no drilling to cabinets and there is a money back guarantee. However, since the lock is on the outside of the cabinet, it can be unsightly. In addition, the cabinet must be flat in order to be able to use this lock – it cannot have any raised areas or have paint or stain that is not flat. But the main issue is like so many other cabinet locks, the adhesive just won’t stick and the lock falls off causing a choking hazard if the child gets ahold of it. There are quite a few choices when it comes to picking cabinet locks. Do you go for magnetic locks, adhesively mounted cabinet locks, cord locks, sliding cabinet locks, or the old sprint release locks? When all is said and done, I believe that the best style cabinet lock is the magnetic cabinet lock. However, since there are so many problems with adhesive, I think that a hardware mounted option is the best. That is why my top pick is the Safety 1st Magnetic Locking System. These safety locks are on the inside of the cabinet and drawers so they are not visible from the outside. This product is by a trusted baby product name – Safety 1st. There is even an indicator to let you know when the lock is engaged. When safety is your top priority, pick a name and product you can trust. Since cabinet locks are such an important product, Safety 1st is my pick.